The local currency settlement negotiations between China and Russia were initiated after the 2008 global financial crisis. Yuan-ruble payments have been conducted regularly over the last 10 years, from initially more ruble settlements to increased settlement with the yuan. After several attempts over the years, the negotiations started to touch the substantial issues, with 2018 being a crucial year for the negotiations. 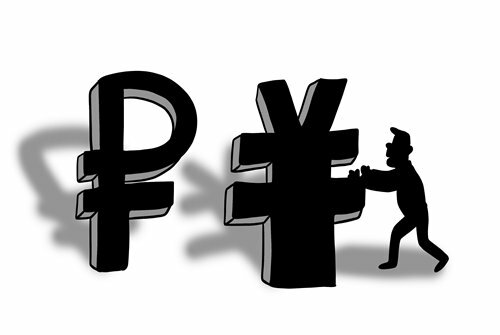 The two sides are planning to reach an agreement that regulates the current yuan-ruble payment. The result of the latest discussions are that the two sides have postponed signing an agreement - not meeting the expectations of people in the two countries, but negotiations have moved forward slowly but steadily. The trade volume in 2018 between China and Russia exceeded $100 billion as of mid-December, reaching the goals set by the leaders of the two countries years ago. The trade achievement though, only tells one side of story. The bilateral trade surged in 2017-18 largely due to price rises of commodities such as oil, gas and raw materials. To continue improving bilateral trade, it is important to further facilitate and support the small and medium-sized enterprises (SMEs). In this context, China and Russia have realistic expectations for the yuan-ruble settlement system. This will allow companies, particularly SMEs, to reduce costs of doing business, thus providing a positive incentive for those businesses. Local currency settlement is a general trend, and China has set a goal for the yuan internationalization. China has created impetus to push forward the yuan settlement with its neighboring countries. As the Belt and Road initiative develops, the trade ties between China and other countries in Europe and Asia including Russia have grown stronger. It will lead to greater demand for the yuan. The somewhat disappointing postponement has given Western media a reason to talk down the prospect of China-Russia bilateral relations, but it should be interpreted rather differently. Firstly, by not signing the deal does not mean the end for the yuan-ruble payment. A significant amount of trade was settled in the yuan and rubles already during 2018. In 2017, 9 percent of payments for supplies from Russia to China were made in rubles while 15 percent of imports to China were settled in the yuan, media reported. The number will likely be significantly higher this year. The negotiations this time focused on the settlement with local currencies of commodity trading. The international rules for commodity trading have already been developed, and as such, changing the rules will cause a great impact that may actually outweigh any benefit. Second, China and Russia have built a strategic cooperative partnership with a high level of mutual trust and respect. The bilateral relations will not be held back by a postponed yuan-ruble payment deal. The experience in the past decade has suggested the China-Russia ties are not against the interests of any third-party country. Groups including politicians, academics, think tanks and media have placed high hopes for the negotiations. Third, the currency settlement negotiations are far from over, with both sides looking for a mutually beneficial model, including a trial implementation in Russia's Far Eastern region. The transformation of the current international economic order cannot accomplish in one simple move. China and Russia will have to set up a long term plan to cope with international order. Both sides are not yet fully prepared to launch a full scale yuan-ruble settlement. For instance, only a few banks in Russia have the ability to settle yuan transactions due to many restrictions. China and Russia will inevitably achieve massive local currency settlement in trade and investment. From a long term perspective, yuan-ruble settlement is a process from an embryonic process to a fully-fledged settlement process. The Agriculture Bank of China issued a debit card in 2009, allowing users to withdraw the yuan, ruble and US dollar in Russian ATMs. In 2014, China's UnionPay and Russian banks signed agreement allowing UnionPay cards to be issued in Russia. Russian President Vladimir Putin, during the Eastern Economic Forum last year, encouraged the use of yuan-ruble payment systems. However, the percentage of yuan-ruble settlement for bilateral trade is still limited. It needs to proceed step by step. Large scale yuan-ruble settlement will naturally happen when conditions are ripe.